Manchester City and PSV Eindhoven have agreed the outline of a deal for left-back Angeliño, who will join the Dutch champions for just over €5million (£4.4million). The 21-year-old spent a successful campaign on loan at NAC Breda in the Eredivisie, which alerted Dutch giants PSV and Ajax, with Angeliño favouring a move to the former. 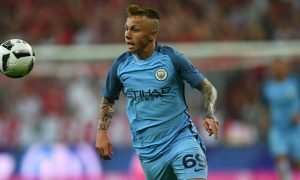 Angeliño has already agreed personal terms with PSV and once the clubs reach a full agreement will continue his career at the Philips Stadion. The player’s transfer will mean City have sold both of their promising Spanish full-backs after VfB Stuttgart broke their club record by paying around €10million for right-back Pablo Maffeo in May. In total Maffeo and Angeliño will have made City over €15million in transfer fees after being imported from Spain in their teens and developed at the City Football Academy.